Stop signs are a common traffic control strategy at many intersections where two state roads cross. One morning in late May, a woman had stopped at just such an intersection on her way to work. A large car on her left blocked her view of oncoming traffic from the intersecting state road, but oncoming traffic was required to stop. Unfortunately, a semi driver was barreling down that intersecting state road and did not slow down when he reached the intersection. Just as the woman left the stop sign and entered, she was broadsided by the semi and killed instantly. The driver of the semi truck claimed he had not seen the stop sign, even though he had a full, clear view of the intersection. He also claimed he had braked heavily before he crashed into the passenger car. Fortunately, the semi truck was equipped with a "black box" or data recorder, which had recorded the truck's exact speed and precisely when the alleged braking had actually occurred. Contrary to the driver's assertion, the black box showed that he had only begun braking about 10 feet before the truck struck the car. Under Indiana law, the amount of compensation awarded to a plaintiff can be reduced if that plaintiff was partially at fault for the incident causing his or her injuries or death. This is called "contributory negligence." In this case, the deceased woman had smoked marijuana about two weeks before the accident, and there was still a minimal but measurable amount of THC in her system. Since Indiana law prohibits driving under the influence of THC, the truck driver sought to reduce the wrongful death award by claiming that the deceased woman had been partly at fault in the crash. 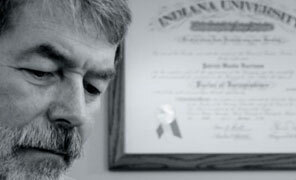 As Columbus, Indiana, personal injury attorney Patrick (Woody) Harrison was able to demonstrate, there was no proof — nor could there be — that the marijuana affected her driving, or indeed that she had done anything wrong at all by relying on oncoming traffic to stop at a designated stop sign. He was able to defeat the contributory negligence defense. With little chance for success at trial, the opposing lawyers agreed to settle the case for $2,100,000.00.